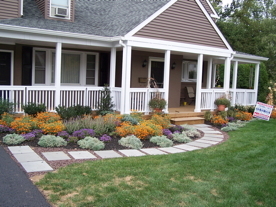 Sunshine Landscapes is your destination for educated yard professionals! Call us when you need a spring clean up, a fall clean up, or any seasonal clean up work, including brush clearing of lots, fields, and pastures. We can mulch your flower beds, your trees, and we also install playground mulch. We will aerate your lawn, do your edging, transplant and divide plantings, and even re-seed or re-sod as needed. Other services include lawn care, tree and shrub care, tree pruning, shrub pruning, weed control, garden maintenance, container garden maintenance, invasive weed maintenance, invasive weed spraying, driveway regrading, driveway resurfacing, sealcoating, playground mulch installation, and tree and brush work (see our Tree Services page for more information).